String art is a technique for the creation of visual artwork where images emerge from a set of strings that are spanned between pins. 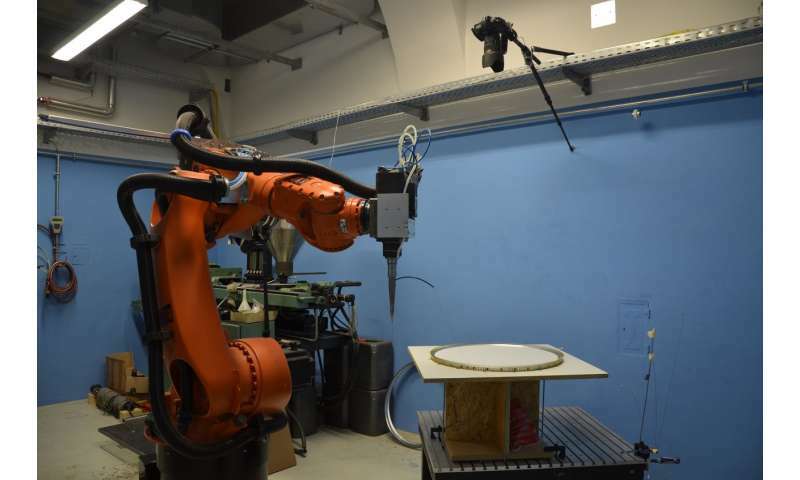 Now, at TU Vienna this work can be delegated to a robot—an example of a complex task that digital fabrication can solve. The basic idea of string art is simple: hooks distributed on a frame are connected by strings back and forth until they fuse to a perceptible image. 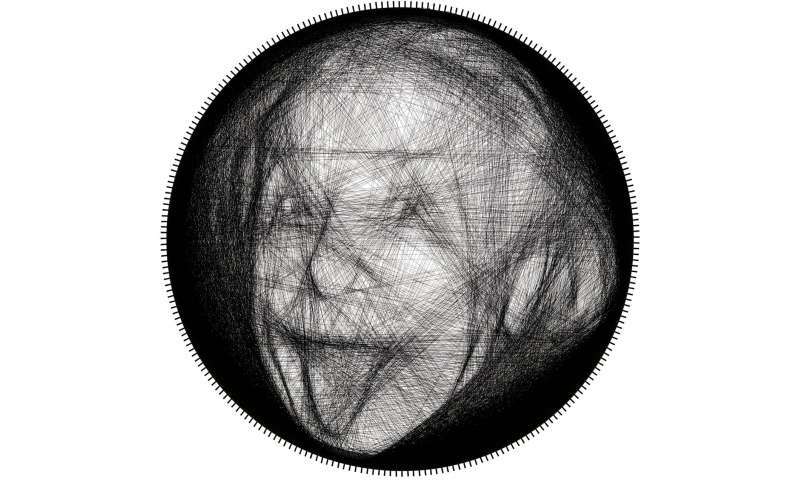 That way, very interesting geometric patterns can be created—indeed, true experts even manage to create portraits. Traditionally, artists craft such images manually in a highly sophisticated and tedious design process which requires experience and a steady hand. At TU Vienna, this kind of creation of artistic images has now been automated: the computer calculates the optimal thread path from an arbitrary given image and an industrial robot then takes over the job of arranging the thread. "From a scientific point of view, this is a very interesting problem because it is particularly difficult to solve," says Przemyslaw Musialski from the Institute for Discrete Mathematics and Geometry at TU Vienna. In general, a picture cannot be exactly reproduced in this way—after all, the thread method cannot be used to set individual pixels, but only to draw continuous lines. It is therefore necessary to find the best possible approximation. This is a challenge: the number of different ways to span a thread between a larger number of hooks is astronomical. It is completely impossible to try all conceivable variants. "This task belongs to the so-called NP-hard problems," says Musialski. "This is the class of computing problems that cannot be solved accurately by computers in a reasonable amount of time." 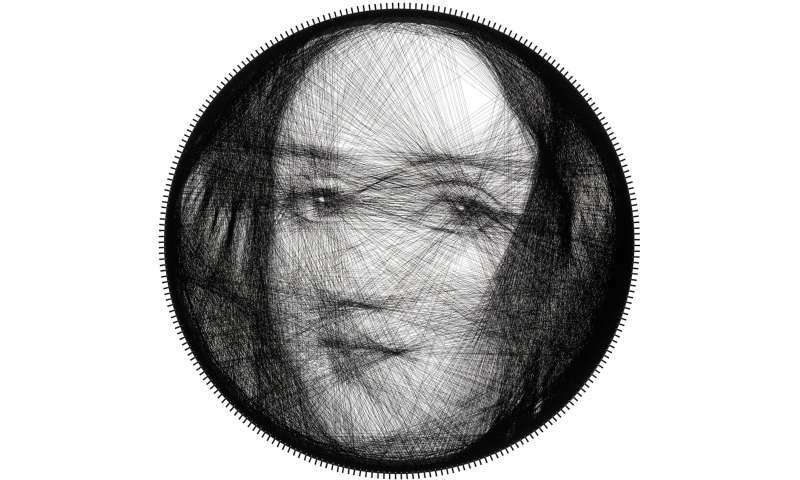 To create the image, a circular frame with 256 hooks is used. "Our calculations have shown that increasing the number of hooks any further improves the final result only marginally," says Przemyslaw Musialski. The thread may be stretched from the right or left side of each hook to the right or left side of any other hook. This way, even with only about 30 threadlines, there are more possible variants than there are atoms in the observable universe—and in order to reproduce a recognizable picture, a much larger number is required. Therefore, it was a great challenge to find an algorithm to compute a path for the thread to reproduce a given image as accurately as possible. However, the mathematical solution to the problem was not enough for the research team. The goal was to produce true "string art" in a fully automated manner. A high-precision industrial robot was used to span a single long thread across 256 hooks in order to create circular string art images with a diameter of 63cm. Even the industrial robot cannot complete this task in a jiffy: Depending on the image, the production takes 2-5 hours and requires between 2 and 6 kilometers of thread. The research team is part of the Center for Geometry and Computational Design at TU Vienna and it was supported by Peter Wonka's research group at the King Abdullah University of Science and Technology in Saudi Arabia. "Even though our robot produces pretty pictures, our work is of course not an art project," says Przemyslaw Musialski. "Ultimately, we want to show how particularly difficult technical problems can be solved. In the string art project, we work with methods that will play an important role in digital fabrication in the future."